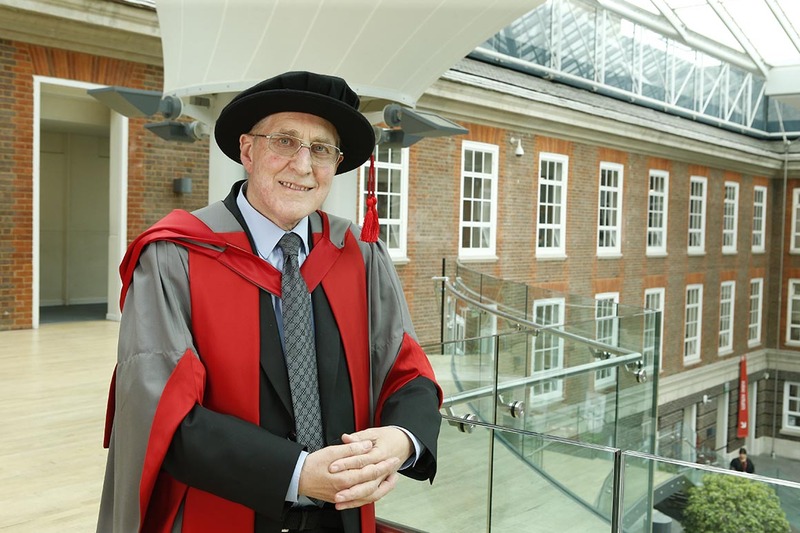 A professor who led a team that developed a pioneering cell transplantation treatment allowing a paralysed man to walk using a frame has been awarded an honorary degree at Middlesex University. Professor Geoffrey Raisman, founded the Spinal Repair Unit at the UCL Institute of Neurology in London. He is Chair of Neural Regeneration at UCL, and received the award at the Middlesex University's graduation ceremony on Thursday 16 July. Professor Raisman, who lived in Hendon, north London for 30 years, is recognised for his work demonstrating the ability of the brain to restore connections lost after injury, for which he introduced the term 'plasticity' in 1969. He and his team recently used the technique developed using specialist cells from the nose, called olfactory ensheathing cells (OECs), in the spinal cord to treat a man paralysed from the chest down following a knife attack to allow him to walk again using a frame. Professor Raisman first discovered OECs in 1985 and successfully showed that they could be used to treat spinal injuries in rats in 1997. He has spent the past decade developing OEC spinal repair techniques for patients. Speaking about his honorary degree Geoffrey said: "A lifetime of research has gone into the question of repairing spinal cord injury. Now that we have the first patient able to get out of a wheelchair, it is a great and unexpected honour and privilege that Middlesex University honours this with a degree. "Should the work and the deeply felt hopes of my team and collaborators lead to the historic advance we envisage, it will be a source of great pride and pleasure to be able to claim that it was Middlesex that first recognised its potential." Middlesex University Vice-Chancellor Professor Michael Driscoll said: "Professor Raisman has been instrumental in developing life changing techniques which has seen a paralysed man able to walk supported again. His pioneering techniques are widely recognised by scientists across the globe. "It was an honour for our staff and graduates to welcome Professor Raisman to Middlesex and present him with this truly deserved award."